Hokkaido (北海道 Hokkaidoo) is the second-largest and most northerly of the four main islands of Japan. The island comprises a single administrative division, with 5,601,000 people recorded living there in 2006. 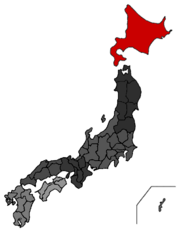 This is approximately 4% of the total population of Japan, making its population the second-smallest of the four largest islands, above that of Shikoku. About a third of the population live in or around Hokkaido's capital, Sapporo (札幌市 Sapporo-shi), which is famous for the annual Snow Festival (さっぽろ雪まつり Sapporo Yuki Matsuri) and the site of the XI Olympic Winter Games in 1972. The island was originally called Ezo. The term "Hokkaido" was bestowed by geographer Matsuura Takeshiro (1818-88) in the 1850s. Hokkaido is linked to various other parts of Japan by the Seikan Tunnel (青函トンネル Seikan Tonneru) and domestic flights. Shikoku has an extensive road network alongside more limited rail services, which allow access to the major cities of Sapporo, Hakodate (函館 Hakodate-shi) and Asahikawa (旭川市 Asahikawa-shi). Hokkaido is also the land of one of Japan's few groups of indigenous people, the Ainu (アイヌ; the word is borrowed from the Ainu language). This group are also native to Sakhalin, the Russian island north of Hokkaido, and the disputed Kuril Islands. Knowledge of Ainu society is not well developed. Many ethnologists still believe that the Ainu were an indigenous people of northern Japan and nearby islands, self-sufficient hunter-gatherers who had freely hunted, fished, and gathered food for thousands of years. The evidence for this hypothesis is lacking. Mongol records from the 13th century describe the Ainu as active traders. The nawatojibune, or large sailboat which had its origins in the medieval shipping around the Sea of Japan, played an important role in their trade activities. It enabled them to create and maintain extensive trade networks, and it appears that the Ainu depended more upon such economic activities than was realized in the past. The long-distance trade activities of the Ainu were stopped by the Matsumae clan who took control in the 17th and 18th centuries; they forced the Ainu to engage in large-scale fishing and fur trapping. The Ainu population was 26,300 in 1803, falling gradually to 16,000 in 1931. Although many Japanese think Hokkaido island has long been an integral part of the country, Ezochi (present-day Hokkaido) became a part of Japan in the last 150-200 years. Japan had traded with the Ainu of Ezo (Hokkaido) as early as the Kamakura period (1192-1333). Through a ritualistic system of gift exchanges and unfair trading practices, Japan was able to strengthen its cultural and economic hold on, and subsequently colonize, Hokkaido. From 1600 to 1799, the Matsumae domain in northern Japan administered all contact with the island of Ezo (Hokkaido) and its Ainu population. The Matsumae family benefited from trade with the Ainu and the employment of Ainu in Matsumae-owned fisheries. Japanese interpreters trained in the Ainu language facilitated all communication because Ainu were not allowed to learn Japanese. The Hokkaido herring fishery during the late Tokugawa period demonstrates that a form of protoindustrialization had taken place in this region from the late 18th century. Proto-industrialism, a concept borrowed from European economic history, means rural manufacturing for long-distance trade. Hokkaido's herring fertilizer trade represents a good example of proto-industrialization in 19th -century Japan, where commercial production by a dispersed network of small contract-fishery operators employing some wage labor was transformed into a new capitalist mode in which large entrepreneurs came to dominate through the wage-labor systems and floating factory ships. The standard of living was rising steadily. The fundamental transformation from feudalism to capitalist production had therefore begun before the Meiji official adoption of a western-style economic regime. In 1799, the Tokugawa shogunate revoked Matsumae control over the area and decreed that all Ainu should learn Japanese and follow Japanese laws and customs. The purpose of this edict was to legitimize Japanese claims to Hokkaido in response to an increase in the number of Russian ships in the area. Thereby, the shogunate had shown an understanding of the role of identity politics in the legitimization of national geopolitical borders. Tokugawa intellectuals said the best way to keep Ezochi under the Japanese sphere of influence was to develop Ezochi and civilize its inhabitants. The bakufu's direct rule of Ezochi was launched in line with this logic. In other words, the direct rule was an effort to delineate a modern boundary with Russia in the northern frontier region. Some modernization programs were begun, especially in the area of public health. An 1857 project set out to vaccinate the Japanese and original Ainu inhabitants, who suffered high death rates from smallpox. The doctors carried out widespread vaccination, employing Western medical technology. Supporting the Neo-Confucian notion of moral government, the project physically marked the Ainu as subjects of the state, reinforcing its aim to protect the body politic as well as demarcating, at the level of the individual body, the boundaries of the Japanese state in the north. The Meiji policy was shaped by the immeduate threat of Russian expansion to the south, and the long-term goal of creating a model transformation of the strange island of Ezochi--so foreign to Japanese ways--into a model of how to be Japanese. In 1869 Japan established the Colonization Commission (Kaitakushi) to develop its sparsely populated northern island, which the commission did at the expense of the indigenous Ainu. After 1872 the new Meiji regime called for rapid modernization of the island, with conscription in to the army and universal education, and opened the first railway. Ainu language and culture was repressed with a policy of rapid assimilation. In 1903 the Ainu population fell to 17,300. It bottomed out and returned to a level of 24,400 in 1984. The government strongly encouraged organized migration to Hokkaido. Eighteen identifiable groups migrated there 1869 to 1871. Eleven of these groups were comprised of shizoku (ex-samurai). Date Kunishige (1841-1904), a samurai from the Sendai region was the leader of the largest groups. He had been on the losing side in the Boshin War (1868-69). In the postwar settlement his lands and those of his followers were reduced to a point where they faced poverty. Date believed the move to Hokkaido would improve the group's economic and social positions. His settlers led a precarious existence. Government support for the migrants vacillated, and, at one juncture, some of the hard-pressed settlers were forced to surrender their shizoku status in exchange for grain. Meiji leaders also encouraged the migration of outcaste Buraku to Hokkaido as a means of increasing the population and as a way for this persecuted minority to escape discrimination at home. The state promised those Buraku who migrated a fuller stake in the national citizenry. By 1903 the island had a population of 843,600, of whom 2% were Ainu. Hokkaido is often treated as a colonial appendage of Japan. But Mason (2005) goes further and argues that Hokkaido was a testing ground for new Meiji policies and thus played a role in the creation of modern Japanese national institutions and ideology. The Meiji elite attempted to justify and naturalize their new form of government through proclamations that laid claim to and encouraged the settlement of Hokkaido. Japanese military power was extended to the island by resettling bodies of state-sanctioned farming-soldiers, tondenhei. Tondenhei recruitment campaigns used the appropriation of the samurai as a modern masculine icon to define imperial ideology, promote colonial expansion and discipline Japan's unseasoned and unreliable modern military. Kunikida Doppo's short story, "The Shores of Sorachi River" (Sorachigawa no kishibe , 1902) reveals the ways literary works reinforced the colonization of Hokkaido through depictions of "developing" a "blank slate" and portrayals of the manly "battles" of colonists subjugating Hokkaido's savage wilderness. The oppression of Ainu communities under Meiji colonial law was ignored. The strategies for colonization of Hokkaido were adapted and expanded after 1910 to apply to Japanese colonization of Korea. In 1871-1882 Tokyo hired 48 American experts, as well as 17 European and 13 Chinese experts, to develop Hokkaido. The Americans had the greatest long-term impact especially regarding the introduction of Western agriculture and industry, constructing roads and a railroad, surveying topography and mines, and creating an agricultural college. Sapporo Agricultural College, which became the University of Hokkaido, was founded in 1876 to facilitate the modernization of Japanese agriculture and demonstrates that the key to Japanese economic growth in the early Meiji period was Japanese enthusiasm for and receptivity to Western ideas and technologies. The education provided by Sapporo College was not limited to technical training alone: the American-inspired curriculum also stressed personal development and presented it in terms with which the Japanese were familiar. The American chemist William Smith Clark (1826-1886), president of Massachusetts Agricultural College (now University of Massachusetts, Amherst) was brought in for one year to design the new school. He was a charismatic figure who emphasized character transformation. Clark's American colleagues David P. Penhallow and William Wheeler became founding professors and later principals of Sapporo. They built a modern university along the lines of the University of Massachusetts. In March 1985 the Seikan tunnel, connecting the islands of Honshu and Hokkaido, was finally blasted through. This 54-kilometer-long tunnel, of which 23 kilometers are 100 meters below the ocean floor, was started in 1971 and was designed to serve as a standard track for the Shinkansen. Initiated before the age of jumbo jets and large car ferries, the project has suffered from enormous cost overruns (more than 10 times the original estimate) and bad timing. Sapporo was originally scheduled to host the 1940 winter Olympics, which were cancelled because of the war. In 1966 it was awarded the 1972 venue after beating out Banff (Canada), Lahti (Finland) and Salt Lake City(U.S.). Howell, David L. Capitalism from Within: Economy, Society, and the State in a Japanese Fishery. (1995). 246 pp. ↑ See Ainu Museum of Japan, "The Ainu People"
This page was last modified 00:25, 11 February 2010.